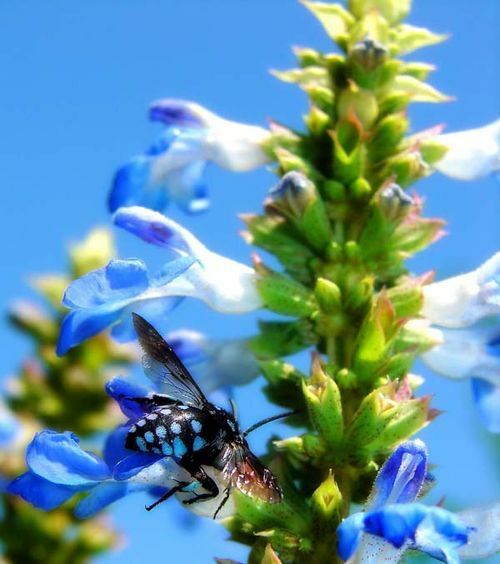 The Cuckoo Bee (Thyreus species) is a black bee with light blue patches on the back and sides. They are called cuckoo bees because they lay their eggs in the burrows of other bees. The Cuckoo Bee lays an egg in the burrow of a Blue-banded Bee or Teddy Bear Bee (members of the Amegilla genus). When the Cuckoo Bee egg hatches, it feeds on the Amegilla bee egg or larvae.